This site is currently still under construction, but please bookmark it and check out what's here. Also be sure to read my important safety features. I've always loved horses. Even being 23, if I am asked 'what do you want for Christmas', a pony is item number one. Sadly, I haven't gotten a real pony ever, and the last time I recieved a My Little Pony was before my sister was born fifteen years ago. It's hard to believe that what was once my favorite toy had been long forgotten, the movies and ponies all sold for pennies at yard sales. Now that I have money of my own, I can start recollecting the ponies I had, and the ponies I always wanted but never got. I am an artistic individual, so when I learned that people can disassemble My Little Ponies and make new ones, I jumped at the chance. I'm hoping my degree in costume design will help me create some truly individual characters. Also, I learned that My Little Pony had started releasing more My Little Ponies just recently. Before college, I had stumbled upon G2 Ponies at Target and thought they were knock off brands, and didn't think much else of them. Imagine my surprise when I went back looking for Barbies for OOAK to find G3 MLP, with cuter poses and a fresh but still signature MLP look. So I've started collecting again, going after the Big Brother and Loving Family Daddy ones first (mommy never got me one, nomatter how hard I begged), and then stocking up on the G3's...and Firefly and a few others I miss terribly. Check out my site for drawn customs and created customs. 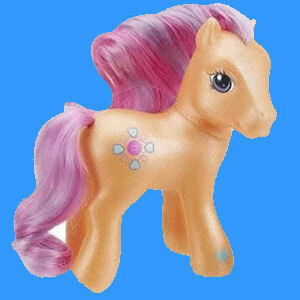 A few of my first customs will not be sold, but I will create replicas if provided with the base pony, where indicated. BTW, all customs are my characters, please don't steal them. Please also visit my Deviant Art page! Also visit my photography page! Is there something YOU need to know about MLP? Chances are this site can tell you! New tales for the new G3 MLP, including customs I've made.